Mariposite is not an officially classified mineral, rather it is a chromium-rich variety of the green mineral phengite. The green color is imparted by the element chromium. Mariposite/phengite occurs in a quartz-rich metamorphic rock also called mariposite. This rock, which is streaked with thin bands of green color alternating with bands of grayish quartz, is named for its occurrence in the southern-most part of the “Mode Lode” (i.e., gold) region northeast of Merced and southwest of Yosemite Valley in Mariposa County, Northern California. Mariposite is associated with gold-bearing quartz veins and has been reported as occurring with visible gold. Mariposite formed when the rock serpentinite, which was derived from the Earth's mantle, became altered under pressure by mineral-laden hot (650°F) water. These hydothermal fluids flowed upward along fractures, faults, and fissures, and where these fluids reacted with serpentine, they formed deposits of quartz, chromium-rich mica, sulfides, and gold. Mariposite is a popular landscaping stone. 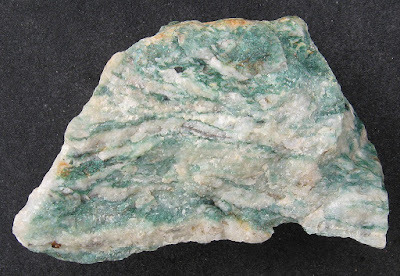 It is also used as a building stone (veneer on walls), as well as for jewelry (as the trade name "Emerald Quartz).